I'm wearing the Marks & Spencer boots that I got last month, they are really comfy considering I don't do heels!! Easy pulled together look! I'm so over heels I killed my feet in the russell and bromley one last thursday - never again! A very cool like my dear! Love this - the outfit looks fabo. I have been scouring thrift stores for something just like that jacket. Such a classic. Great look! Love the jacket, what a great vintage find. I think that I would wear it with a black sheath dress and a fabulous brooch on the lapel. Oh I loooove the blazer! your blazer is a classic. OMG! I luv the SIMPLICITY and ELEGANCE of this FABULOUS OUTFIT! p.s. YOUR posts are solely inspiring, I luv,luv, luv them!!! Hi there-such lovely comments, thanks so much to you all!! Oooh, lovely blazer - very now, too! Great outfit! That Armani jacket could have looked mumsy but I love it in this combination. Ooh, jackets! I love jackets, passionately. That is a rather fabulous one my dear, well done!! 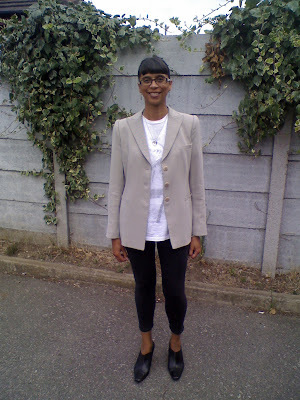 I like that blazer on you - Great fit - simple/elegant/casual all at the same time! I'm sure you'll be showing us additional color combinations & will find all kinds of ways to use this great jacket to bring variety to your wardrobe. Love your blazer, dear, you look so chic and elegante. Fabulous blazer! And I love how you paired it with the leggings. You look so casual chic! Hi ladies-thanks for all of these wonderful comments!! Great laidback look! Hope you are well, I had an amzing time at Fashion Week! Hi Silje-thanks so much my dear, have a great week!